Dehydrated banana chips, dried strawberries, jerky – anyone want a healthy snack? If you’re like me, you enjoy snacking on healthy goodies that are made locally. A commercial dehydrator can help you make and enjoy these delicious munchies without the additives and preservatives found in store-bought snacks. Want to swap your overly-salty and fattening chips for something more nutritious? These three commercial food dehydrator are the best and one of them might suit your needs. 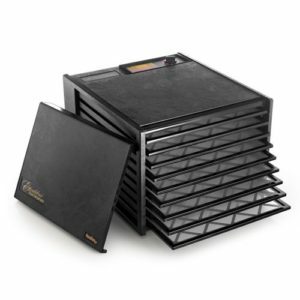 Why I like it: The commercial Excalibur Deluxe Dehydrator is definitely one of my favorites. Its large, square size fits 9 trays of fruits, herbs and even meat in one go. It’s compact enough to be used at home yet large enough for commercial use. Great for large families, it is also part of my list for the best jerky dehydrator. The adjustable thermostat makes it safe to dry meat while accurate controls make this dehydrator versatile in drying pet treats, crafts, vegetables, flowers – you name it. If you are looking for an all-around commercial dehydrator, go for the Excalibur Deluxe Dehydrator. 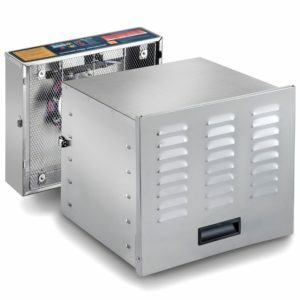 Why I like it: The STX International Dehydra Food and Jerky Dehydrator is larger than the Excalibur with its 10-tray capacity – making it more suitable for bulk preparation. Made with stainless steel, it is built for constant use. The product also comes with a 3-year warranty. Unlike the Excalibur, this commercial dehydrator has a 40-hour digital timer for greater accuracy. Although this is larger than other jerky dehydrators, this product can fit most kitchen countertops. Its hinge-less design makes it suitable for a space-challenged environment while also permitting an easy clean-up. If you constantly make jerky and dried snacks, then this food and jerky dehydrator is worth the investment. Is it your first time to use a dehydrator? Then you might want to read the Best 3 Food Dehydrators for Jerky before you buy a commercial dehydrator. These dehydrators are perfect for home use. Why I like it: Invest in this big boy only if you are really serious about making your own dried snacks! It has a large 16 sq. feet drying space that houses 10 stainless steel plates, and can heat up to 165 degrees. This means that you can make “safe jerky” according to USDA’s safety standards without the need to preheat your beef. This commercial- and industry-grade food dehydrator also features a digital auto shut-off timer for your convenience. Made entirely of stainless steel, it’s easy to clean and assemble. 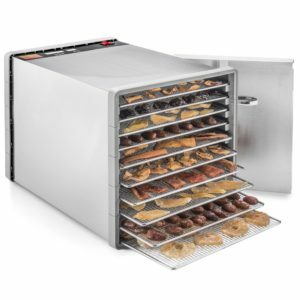 Check out the STX International Dehydra Stainless Steel Digital Food Dehydrator if you have a restaurant and bistro – or if you just love making lots of dried snacks and jerky! This is the best commercial dehydrator in the list. Excalibur and STX International are the top brands to check out if you are looking for the best commercial dehydrator. They provide large and powerful dehydrators that can dry anything from slices of fruit to lean meat. Their high-temperature capacities allow them to make food-safe jerky according to industry standards. 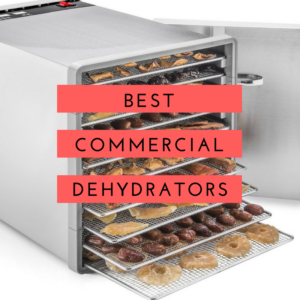 Let us know in the comments if you’ve tried one of these commercial dehydrators or have any questions!